The public is becoming increasingly aware of just how much of the food we produce ends up as waste, but the numbers can still astound. As pointed out in a previous blog, the U.S. Environmental Protection Agency (EPA) estimates that Americans threw away 36.73 million tons of food waste in 2012, and only 1.74 million tons of this waste was recovered or recycled. A large amount of the organic waste generated in the long food supply chain of agricultural production, processing, distribution, sale, and consumption comes from those links that precede the point at which you bring the food home and eat it (or not). According to EPA data, however, there’s still quite a bit of scrap that we generate in the course of managing our kitchens and our meals. And there’s ample opportunity to reduce that waste volume. As part of its “Food – Too Good to Waste” initiative, EPA has broken down the food and drink waste in our kitchens into three categories: “non-edibles,” constituting about 18% of the total; “possibly edible,” amounting to another 18%; and then “preventable” waste, which accounts for the remaining 64%. Of the preventable waste, says EPA, 40% is generated when we make or serve too much food for any given meal, and then throw away the leftovers. About 55% is “not used in time”—that is, the stuff at the back of the refrigerator or cupboard that we forgot about, and finally found and tossed because it was past—and maybe well past—the expiration date. (How many of us have found stuff that is more than two years old?!) The remaining 5% comes under the “other” category—maybe the proverbial fruitcake you never meant to eat in the first place, but haven’t passed along to a relative yet. There are steps we can all take not only to reduce the volume of that “preventable” waste, but also to manage better the “possibly edible” and “non-edible” food scrap as well. And while it will take a little planning and some modification of routines, the job needn’t be burdensome, and can even be gratifying as you strive to squeeze more out of your food budget. Before we offer some tips on reducing food scrap, it should be noted that managing kitchen-related waste better isn’t only about the organic stuff; tackling kitchen waste means tackling the packaging side as well. They go together, and many of the tips listed here suggest ways to reduce the amount of food scrap and packaging materials you put in the trash. First, that non-edible portion of food scrap—corn cobs, broccoli stalks, onion skins, etc. Consider composting these materials. Collecting this scrap in the kitchen and depositing it later in a backyard composter is not only possible—many Melrose residents are actually doing it. Small kitchen composting containers are commercially available, the Melrose Department of Public Works sells composting bins on an annual basis, and the Melrose Recycling Commission stands ready to help the city’s residents understand better what’s involved in the composting process. The topic deserves more in-depth discussion than we have room for here, but composting certainly can be a key part of the solution to reducing waste. As for the possibly edible fraction of food scrap, we’re talking here about such things as potato skins, beet greens, and other portions of the produce you buy but may not typically eat. Potato skins, for example, have more nutrients than the rest of the potato; leave them on rather than peeling them, or look for a recipe for one of those appetizers now popular in many restaurants. Beet greens sautéed in butter and lemon are delicious. If these uses of the “possibly edible” don’t appeal to you, composting these materials remains an option (but don’t include meat or animal fats; although some innovators are finding viable ways to compost these materials too, it involves more technology and capital investment than you can put into your backyard). Shop your refrigerator first. Use what you have before you go out shopping for more food. Perhaps set aside one or two evenings per week for a “use it up” meal. Use those leftovers (I work at home, and eating the leftovers for lunch is my second “job”). Plan your weekly menu before you go shopping. Preparing a list can help reduce “binge” purchasing, especially when shopping at Costco or similar “bulk” stores. Fruits and vegetables can “hang out” longer than you expected. Freeze or preserve them. Be creative. Use food that you might ordinarily throw away but is still safe to eat. For example, bread that’s a bit off its freshness, or even stale, is ideal for things like croutons or bread pudding (renowned Boston cook Jasper White has a great recipe that includes chocolate). Food that’s past the labelled expiration date hasn’t necessarily gone bad; it’s just lost some of its flavor. That’s what spices are for! Buy certain foods in bulk, when possible—although do be careful not to buy more than you are likely to use. Instead of paper or plastic bags, use your own reusable bags, which are made of cloth or other materials and are now widely available. They can (and should) be washed every now and then. And there are now commercially available mesh produce bags from the likes of EarthWise (earthwisebags.com), ChicoBag (chicobag.com), Flip and Tumble (flipandtumble.com), and Blue Avocado Mesh (blueavocado.com). Shop at farmer’s markets for fresh produce and to reduce packaging. You’ll probably have to improve your meal planning, and buying fresh produce can generate more leftover organic material—leaves, corn cobs, greens, etc.—but these can be composted or even consumed (e.g., those beet greens). Review your pantry every three months. Keep the items closest to expiring in the front. If you think some items won’t be eaten and they are getting close to their expiration date, consider donating them to a food pantry. Cut up large roasts or poultry into meal-size portions after that first meal and vacuum-seal and freeze the portions you won’t be serving in the next two or three days. What types of plastic bags can be recycled? 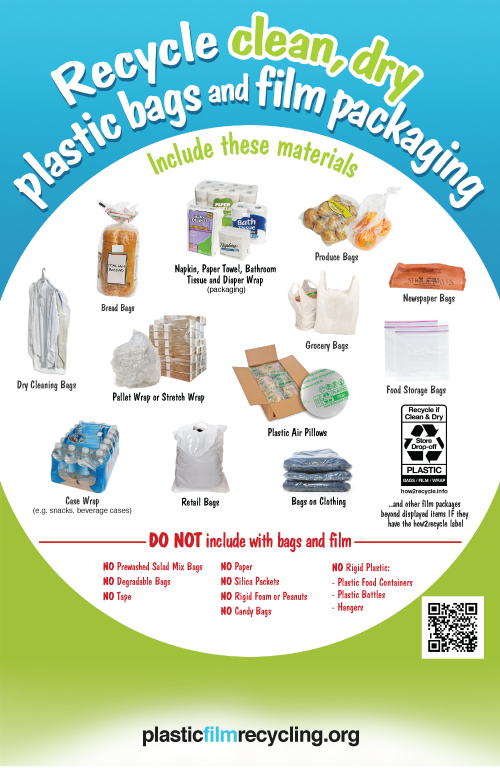 Keep plastic bags out of your curbside recycling bin and recycle them at local grocery stores. Check out the picture below to find out which bags can and cannot be recycled. Learn more about plastic bags here.